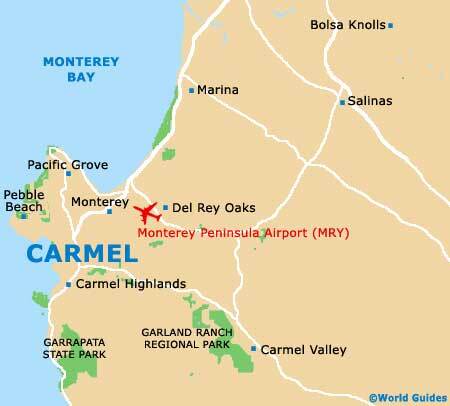 Much of the thriving Californian community of artisans within Carmel, otherwise known as Carmel-by-the-Sea, actually originates from the nearby city of San Francisco, when many chose to relocate here just over 100 years ago, following a major earthquake. Carmel has grown in popularity and stature every since, and despite its tourism industry, successfully manages to retain its undeniable Bohemian character, ordered community and rather rustic appearance, with no street lights or even paved sidewalks to speak of. The architecture of Carmel is extremely diverse, contrasting with the beautiful sweep of the adjacent Pacific Ocean and coastline. Meandering alongside the beachfront, the suitably named Scenic Drive is worth experiencing, while in the town center, Ocean Avenue provides the main thoroughfare, being lined with an endless selection of galleries and leading to the pristine beachfront. Close by and on the intersecting San Carlos Street, the Carmel Chamber of Commerce provides current tourist information and operates as a visitors center. 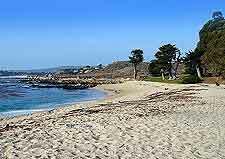 Known for its intimate village atmosphere and appearance, the town of Carmel-by-the-Sea is at its very best during the sunny summer months, when crowds converge at the nearby Pebble Beach, or spend the day on the Carmel Beach City Park, where evening parties have become commonplace. The escape the summer tourists, you can always head to the Carmel River State Park, where the Monastery Beach is a particular highlight. Alternatively, further beaches are to be found within the Point Lobos State Reserve, while for some unusual entertainment, consider watching one of the outdoor movies at the Forest Theater. More information about Carmel Tourist Attractions. There is no mistaking that Carmel is a very historical town, with many old buildings clearly illustrating its development over the decades. The First Murphy House on Lincoln Lane is especially significant, as is the Carmel City Hall on Monte Verde Street, which actually started life as a church before being used by local government and town mayors. Of interest, in the eighties, movie-legend Clint Eastwood served as the town's mayor for just one term and regularly met at the City Hall. 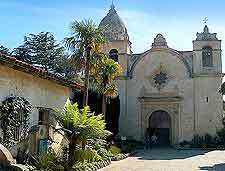 Other important structures include the Carmel Mission, which features very distinguished Moorish-style architecture and superb vistas from its bell tower, and the Harrison Memorial Library, where important regional archives are housed and displayed. More information about Carmel Landmarks and Monuments. For further historical information, there are a small number of museums, both in and around Carmel. These include the Tor House and its Hawk Tower, which features a rather surprising past celebrity guest list, and also the family-friendly Pacific Grove Museum of Natural History, where an exceptional California Condor exhibit stands out. Art galleries are more than plentiful, appearing around virtually every single corner and numbering almost 100 in total. The Carmel Art Association is worth looking out for, as is the Highlands Sculpture Gallery, and the New Masters Gallery, where you can purchase beautiful photos of the Monterey Peninsula coastline. 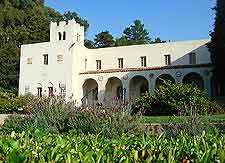 More information about Carmel Museums and Carmel Art Galleries. Many coastal attractions and beaches are close to Carmel, being made all the easier to reach when tourists have rented their own set of wheels. 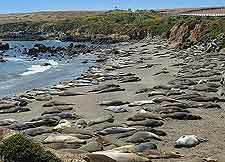 Monterey Bay is especially close, along with Big Sur, Santa Cruz and San Jose. Head further north from Carmel and you will eventually reach Oakland and San Francisco, while to the south are the beaches, museums and historic amusement parks within the sunny city of Santa Barbara. 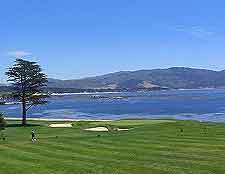 If you have left yourself with a spare day and wish to take things at a more leisurely pace, then consider taking a drive along the very famous 17 Mile Drive, passing the Del Monte Forest and the Pebble Beach Golf Links along the way. More information about Carmel Attractions Nearby.